The Mohawk Oakhurst Golden 3/8 in. Thick x 3 in. 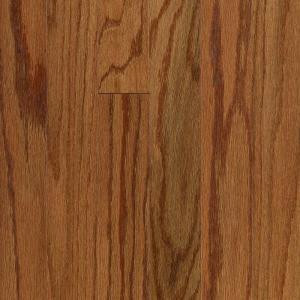 Wide x Random Length Engineered Hardwood Flooring infuses your home with classic sophistication. With bold graining and golden hues, this stunning hardwood flooring is treated with a Scotchgard Crystalshield aluminum-oxide finish that provides the durability needed to withstand everyday household activity. The flooring features engineered oak construction for long-lasting strength. Made in the USA. 28.25 sq. ft. per case. Case weight: 34 lb.